Among the principal singers there was not a weak link. Ekaterina Gubanova's Brangäne was sensitively characterized as a woman of strong passions, dedicated to placing duty before desire. She sang with fine phrasing and clear diction. The rich, dark tone of her mezzo, too, made an effective contrast to Stemme's gleaming soprano. 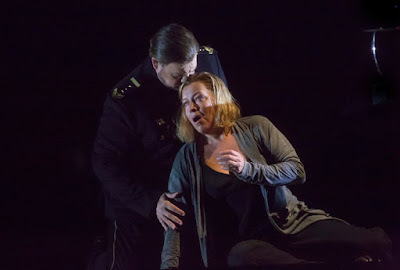 Gubanova's use of her physicality also compared interestingly with Stemme's, notably in Act I, where Brangäne's fierce control is the ineffective counterweight to Isolde's rage. "Habet acht!" was impressively steady and centered, as was the beautifully spun-out "Einsam wachend." Evgeny Nikitin, as Kurwenal, sang with a rich variety of vocal color, and good attention to text. Kurwenal is, arguably, a character remarkable for his lack of introspection, but Nikitin made him sympathetic. His loyalty to Tristan is no less absolute for being yoked to unusual clear-sightedness concerning his beloved hero's weaknesses. I didn't feel that the cuts to his role in Act III seriously affected characterization. To lavish superlatives on René Pape's König Marke is also to state the obvious. Pape's command of vocal line and of text is absolute. Every syllable of his reproach to Tristan was weighty, devastatingly poignant. There were points when it became nearly a soliloquy, his meditation on his past contentment, his betrayed trust, his devastated hopes, but he would periodically return to Tristan, to insist on looking him in the face, e.g. on "Wozu die Dienste ohne Zahl...?" It was a profoundly human gesture, of course, but also tragic in its futility. We know that Tristan only desires to behold the night, and Marke, resplendent in his uniform, is a representative of the realm of day, despondent though he is. 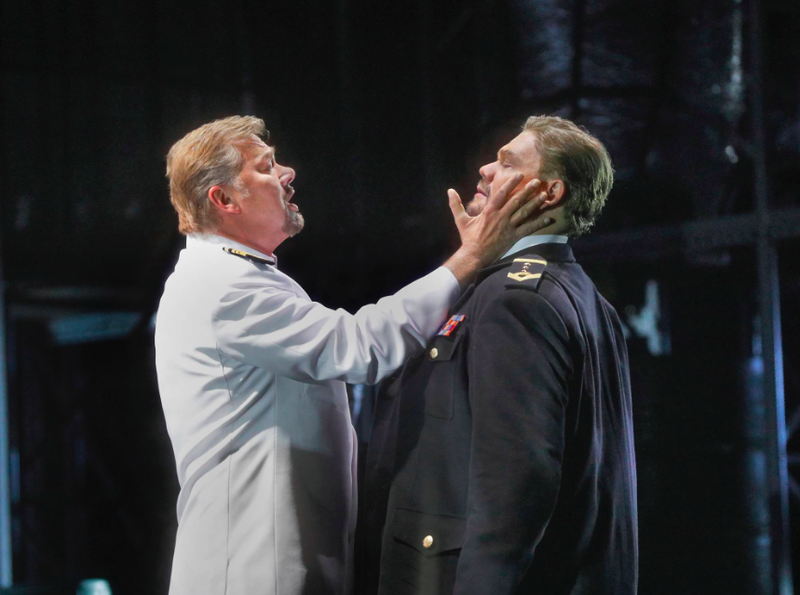 Significantly, in my view, Marke's radiant uniform is obscured when he enters in Act III (by a workaday oilskin, I think, but my vision was by that time blurred with tears as well as the distance of the Family Circle.) He is there--in the sickbay--in a private capacity, offering a bouquet of white carnations, symbol of pure love. They are discarded on the stripped hospital bed as the king mourns; I mourned with him. Stuart Skelton's Tristan would have been remarkable even if judged by Act III alone. But I shall try not to anticipate. Unlike Isolde, on whom there is consensus, Tristan is a man whose qualities are much disputed. He is Tristan der Held, faithless and loyal... and, in a way that can feel unexpected, the delirious philosopher of Act III. Skelton cultivated a quiet authority (vocal and physical) that worked well to establish his character in Act I. He may be a man living on his nerves, but he is also introspective, an observer. "Herr Tristan trete nah" is here a command that is ignored: Isolde is brought to Tristan, as the ship's captain. In public, then, Tristan demonstrates his authority... but behind closed doors, he lets Isolde have free run of his quarters, even to the point of examining the papers on his desk (and, more tellingly, running her hand over his chair.) He is also, in this reading, a man deeply shaken by the discovery of the inevitable. In Act II, Skelton sang with warmer and fuller tone; while Tristan may be caught between two worlds, his ardor is unshaken, steady. These may seem unusually mild words to use for this opera, but I found this focus on mature desire, rather than febrile longing, very moving. I also appreciated Skelton's dynamic restraint in the final scene of the act. "Wohin nun Tristan scheidet?" was here a hallucination, but no less tender and intimate for being so. It was in Act III, though, that he was strongest. The relative vocal restraint of the first two acts was entirely cast off. The sustained phrasing and the hallucinatory repetitions were given sustained emotional tension, as well as weight, culminating--as they should, as they must--in the curse. It filled the house, searing, devastating, absolute. The imagined triumph as he prepares to greet his Isolde is undercut by his broken phrasing; he is a dying man. But I couldn't feel this as a defeat. Nina Stemme's Isolde was glorious. I declared my love for her after the first act; after the third, I couldn't breathe. Stemme gave Isolde anger and fierceness and radical vulnerability. In Act I, she is physically exhausted by the force of her rage, and the force of her desire; she can find no resources but isolation, attempting--already--escape from the world. Her narrative was steely, almost frightening in its focus, Stemme's vocal control suggesting the fundamental power of the woman whom we see claustrophobic, ill at ease... and very, very angry. In this staging, her curse is simultaneously almost a call to Tristan, as if at some level, they both already know that this annihilation is something they must seek together. Tristan is enough in love with her, of course, that her attempts to bait him fail entirely, shattering against the truth that inevitably, irresistibly envelops them both. When, in Act II, Isolde laughs at Brangäne--"Frau Minne kenntest du nicht? Nicht ihres Zaubers Macht?" --it is her sense of reality, for once, that seems more accurate than that of her loyal servant. (It is perhaps obvious that Stemme's use of text was excellent.) I particularly liked that the light she quenches is that of the ship's navigation panels, rejected in favor of the night's knowledge, which she so triumphantly embraces. Stemme sang with rich expressivity, warmth and sensuality replacing the tensions of Act I; I cried when she promised to accompany Tristan. I am usually brokenhearted for Act III Isolde, but in this production, it seemed inevitable that she would--one way or another--attain her will. Her grief, violent and tender by turns, is of course gutting. Again I was struck by the ways in which the production allowed the metaphysical and the intensely personal to coexist. As Isolde declaims "Nicht an die Wunde! An die Wunde stirb mir nicht!" with searing intensity, refusing to accept this brutal, finite thing as the defeat of their union, she is simultaneously feeling Tristan's body with light, swift motions, with professional deftness and with the expertise of a lover. This is the first production I've seen live where Isolde commits suicide; I never expected to find such an interpretation convincing, but here it felt inevitable, a decision taken out of very positive desire, rather than a sense of impossibility. And her Liebestod, following her last visions of a violent world, was nothing less than transcendent, challenging and exultant. Her voice opened realms; her absolute certainty was all-embracing, reality-changing, as her lover was restored to her arms, as they were absorbed into the waves, as, finally, the music found its fulfillment and melted into silence. Thank you so much! It's always nice when you join discussion here. And I agree entirely: Wagner always calls for lively conversations!